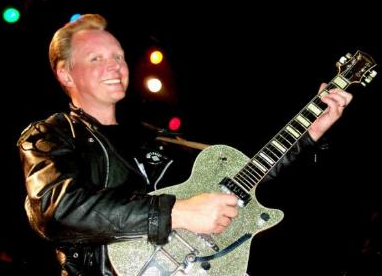 Billy Zoom's unmistakable rockabilly-infused playing style and tone was a key element in the LA band X's sound. At the heart of it was Zoom's late fifties Gretsch Silver Jet. When the Gretsch/Fender Custom Shop in Corona, California attempted to recreate Billy's famed sparkled guitar, it put it through a CAT scan and discovered that the particular vintage Silver Jet Billy owned was almost 95% hollow. This chambered style, which Gretsch had not utilized since the late 1950's created an extremely light and vibrant body that "resonates sensually to the player's touch and reacts favorably to amplifier interplay."